I am a big believer in occupying the hands of little ones as we instruct them. They enjoy doing things themselves and having a finished product to show parents and this way when asked “what did you do today?” they can show something. Of course, the hope is that parents look at it and then discuss it too! 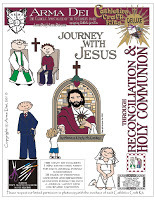 Monica McConkey of Arma Dei: Equipping Catholic Families emailed me a kit that I choose for review, the “Journey with Jesus” scrapbook which includes the seven sacraments; explanations of sin, the domestic Church, and the Mas as well as definitions from the catechism and prayers. She breaks down the topics very well, asking questions with space for answers and helps lead the children to understanding by making the faith personal and relevant to their lives. The line drawings were done by Monica’s daughter, are well done and appealing. Plus, they are big enough to color if you want. The logistics of the kit are fairly simple. You order on line at the Arma Dei website and the have the PDF download immediately. Be sure to print on only one side your paper. (my advice, so you can learn from my mistakes) Other supplies needed are scissors and glue, crayons if you’ll be coloring the pictures. If you want to make a cover, you’ll need card stock or construction paper. Instructions are included to make an accordion fold book or you can cut each page, glue it onto construction paper and make a larger book. What I like about the craft is the flexibility, both of the content and finished product. Depending on your needs, each sacrament could be made separately, the prayer pages to make a prayer book, the Mass pages to make a Mass book or whatever suits you best. If I were to do it with a class, I’d probably make a scrapbook with construction paper, rather than an accordion book. I am passing this on to the second grade catechist and will have the other catechists take a look on the website and see what they would like for their classes this year. I think this is an excellent product, practical yet engaging and most of all, very accurate in presenting the truths of our faith. There are many other kits, games and resources on the website, both free and for a fee. Monica is also about to release a new series on Super Saints. Here is a video to learn more. You are sure to find something you can use for you family or class.